A Turkish court sentenced 14 staff members from the country's leading independent newspaper to prison Wednesday. 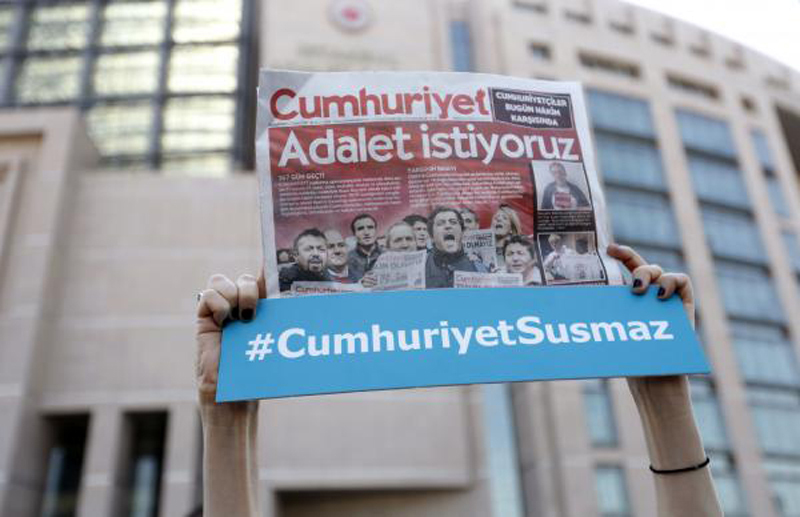 Journalists for the Cumhuriyet newspaper were sentenced to between two to seven years in prison after the Turkish government accused them of supporting what they consider to be terrorist organizations including the Kurdistan Workers' Party and a movement led by cleric Fetullah Gulen, who is believed to have masterminded a failed coup while in exile in the United States. Akin Atalay, the newspaper's chief executive who had been imprisoned for more than 500 days, denied the paper had aided terrorist organizations. "The primary role of a newspaper is not to make money, but to present news, truth, criticism and views to the public," he said. Atalay was sentenced to seven years, three months and 15 days in jail, while editor-in-chief Murat Sabuncu and investigative reporter Ahmet Sik were each sentenced to seven years and six months in prison. All staff members will remain free while their cases are appealed. Three journalists were acquitted and the court ruled the case against former editor-in-chief Can Dundar, who was originally named prime suspect, would continue separately. Sabuncu was defiant after the ruling, declaring neither he nor the paper were dissuaded by the case. "I see this as an attack against us and against all the journalism community, against all our colleagues for us not to practice journalism in Turkey, to be scared while doing it," he said. "We can go to jail one more time if necessary. We will go on doing journalism with courage." More than 50,000 people, including 160 journalists, were arrested in a government crackdown following the failed coup in 2016 that shut down 170 news outlets in the country. Turkey's representative of the Committee to Protect Journalists Ozgur Ogret said the verdict sent a desperate message. "The authorities were unable to prove their claims of malpractice and connections to multiple outlawed organizations at court," Ogret said. "Turkey's political climate demanded a sentencing, so they did with the vague terrorism law clause of 'aiding a terrorist organization.'"